Blade length : 34.3 cm or 13.50 inches. Sori : 0.5 cm or 0.19 inches. Width at the hamachi : 3.03 cm or 1.19 inches. Kasane : 0.53 cm or 0.20 inches. Shape : Wide and thick healthy Wakizashi. Jigane : Itame Hada and Mokume Hada with Jinie attach. Hamon : Ko Nie Deki, rounded shape Gunome Midare. Boshi is round and Togari Gokoro shape. in Mino province. Probably the division of labor was estanlished. In Edo period, the demand for sword is diminshing. So Mino sword smiths moved to other place. Saya : Red color Kawari Nuri Kizami Saya. Tsuba : Copper Hamidashi Tsuba. Menuki : Shakudo, horse is engraved with gold color. Fuchikashira: Shibuichi plate, flower is engraved with gold color. 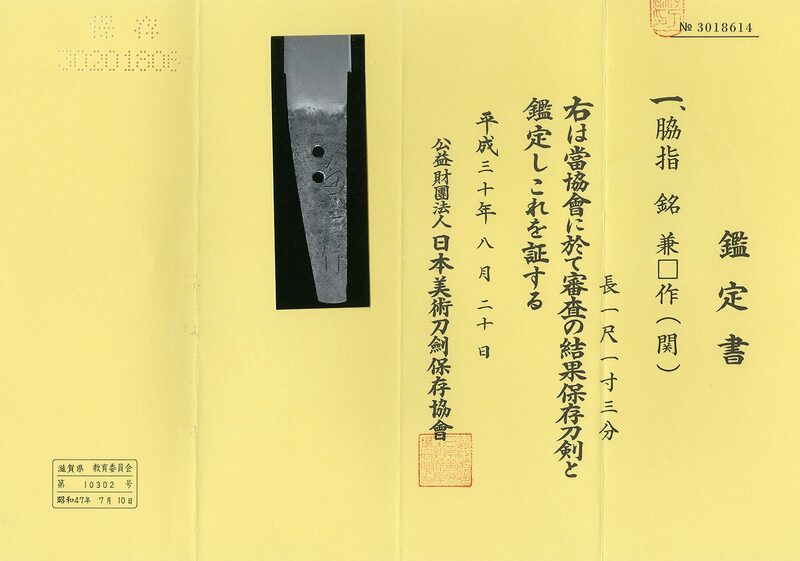 Kozuka: Shakudo Nanako, cherry blossom is engraved with gold color. Kogai: Shakudo, wise man is engraved with gold color. 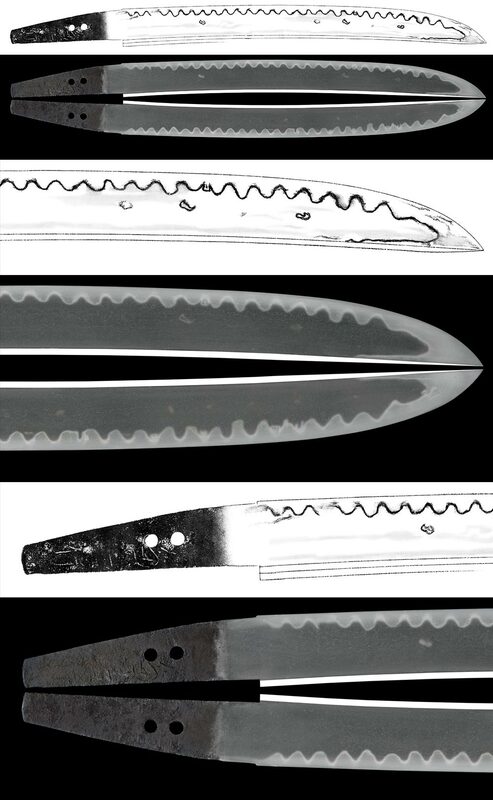 Kaeritsuno and Kurikata: Shakudo, some design is engraved. From Aoi Art: This Sun nobi Tanto has Saki zori. The Jigane is Itame Hada and Hadadachi. You can see the fine Chikei. The Hamon is bright. We recommend this Tanto for you. Back ground of age: War time.